Howard my husband, Howard the daddy and Howard the love of my life. That was five years ago before it all happened. Now I have Howard the new husband, Howard the new daddy but he will always be the love of my life. I don’t want you to feel sad when reading my story, try and draw strength from it and however hard it is try and see that there is a light at the end of the tunnel however bright that may be. Try and be strong, stay strong and surround yourself with those who will support you and who will always be there for you. Firstly let me tell you a little bit about Howard. He was a lovely gentle man that would do anything for anyone especially our daughter and me, nothing was ever too much trouble. He was the best husband, a great father and a lovely brother and son. As his wife I could tell you so much but I’ve decided to quote a few words from his colleagues in their get well wishes. 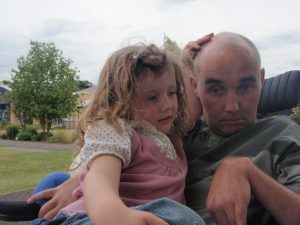 Howard was a fit 41 year old man and rarely ill. Our story begins a week before Christmas 2007 on the 19th December. 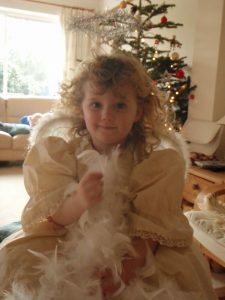 We had just watched our daughter’s first nativity play she was just 2 ½ years old and was dressed as an angel. Howard went off to work and a few hours later I received a call that would change our lives forever. Howard had felt a strange sensation in his neck and then found difficulty breathing. He realised that he needed to get to hospital asap so rather wait for an ambulance his work colleague took him, he was still able to walk into A&E at East Surrey Hospital. I made the frantic drive to the hospital not knowing exactly where it was and just saying over and over again ‘Howard just hold on for me’. All I knew was that he was in surgery but because I wasn’t being told much I knew it was serious. The consultant explained that everything had happened so quickly and that Howard had had some kind of bleed in his neck which caused his neck to swell so dramatically that he went into a respiratory arrest that then led to a cardiac arrest. I was told that they had managed to get a small amount of oxygen into him but he had been some minutes without oxygen before they could give him an emergency tracheotomy. Whilst I waited for Howard to return from surgery my thoughts went to our daughter to ensure she was looked after and to tell immediate family of Howard’s condition. Eventually I was able to see him in ICU. He was sedated, on a ventilator and unrecognisable as his neck had swollen so much that it was wider than his head, a very shocking sight. His mouth had been packed with gauze to stem further bleeding, he just didn’t resemble the Howard that had left earlier that morning. Family and close friends came to our side as soon as they could and I spent the night on the ICU waiting room chairs with my sister. Howard’s colleagues from Parcel Force went about arranging accommodation for us and paid for absolutely everything for as long as I needed, one less pressure I had to deal with which I cant thank them enough for. Our daughter was with my mum and dad so I knew she would be happy and cared for which meant I could give my all to Howard. During this first night Howard had to undergo emergency surgery to stop further bleeding and in the days ahead had various brain scans to access the potential damage. Everything was a blur Christmas festivities were going on around us but we were in the world of ICU. Christmas eve Howard underwent exploratory neck surgery and it was during this Howard had complications and a vascular team was brought in. I was being updated regularly and I really thought I was going to loose him. He however was a strong man and pulled through although this compromised situation caused him to have a bleed in his brain. I managed to make it home for a few hours on Christmas day for our daughter’s sake but felt the need to be by Howard’s side as it was such early days. In the following days ahead Howard’s sedation was reduced to see if his brain could function and what damage may have occurred but as soon as this was done his blood pressure rocketed, heart raced, was unable to control his temperature and had profuse sweating. Different types of sedation were tried but as he came off it he went into severe body spasms and looked so distressed. Although his eyes were open they didn’t follow you and he was unable to follow commands. I spent many hours in ICU and in that time built a good repport with many of the lovely nurses however I did appreciate that as situations could change from second to second they couldn’t always find the time for a chat. I forced myself to go home for a few hours to see our daughter and although I missed her terribly I didn’t want her to see me distressed. The support of my family and close friends was invaluable at this time , I couldn’t have done it without them! I made sure I took pictures of Howard, myself and our daughter into ICU not only to try and stimulate him but also personalise him to the nurses. I also played music and talked to him constantly and made sure he was positioned as best he could be for his comfort. The New Year what was that going to bring? Well Howard had his legs put in splints to stop his feet dropping and he was gradually weaned off the ventilator. He had an angiogram to see whether the vessels in his neck were normal which essentially they were and had further scans. I did however need him closer to home as I was still staying at the hotel. At last in January 2008 Howard was transferred to Frimley Park HDU. We were lucky to be involved with the specialist pain nurse who through medication was able to reduce any potential pain Howard may have been in and just unable to communicate this to us. 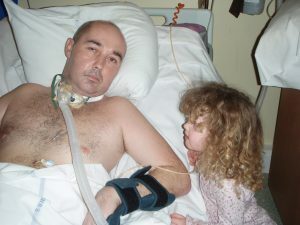 By February 2008 Howard was stable enough to be transferred to a medical ward. This was a bit of a shock as it was busy, smelly, lots of older men and the staff were stretched. I felt I needed to be with Howard as much as possible as I was his voice but despite this I did meet some lovely staff. I continued to stimulate Howard as much as possible and made sure the staff saw pictures of him to show them that he hadn’t always been like this. It was in the ward I decided to take our daughter in to see him. She now knew that he was very poorly and in hospital. I got the nurses to make him look as comfortable as possible and to take off the hospital gown as she would associate her daddy in bed without a top. It was a very emotional time for me and I was hoping that seeing or hearing her might be the simulation Howard needed. She took it in her stride but sadly Howard didn’t react to her but that never stopped me from trying and still doesn’t now. She was intrigued with his trachi, nasal gastric tube but mainly his wee bag!! I have always been very honest with her about her daddy which I feel has made her very comfortable and confident around him and others in a similar position. It was in the ward that he was fitted with a PEG feeding tube, this goes directly into the stomach and it was here where he contacted MRSA and c.diff however I now realise that this is part and parcel of a long stay in hospital. It wasn’t long before the process of moving Howard to a rehabilitation centre started and we were very lucky to be accepted to the Royal Hospital for Neuro-Disability. April 2008 we moved to this Putney hospital and very quickly Howard’s medication was changed and he started to look more comfortable than he had done so in months. He was assessed for a wheelchair and within several weeks was regularly sitting up for short periods. He wore clothes for the first time and was starting to look and smell like the old Howard. He was lucky to have a single room which we could make his own so I put lots of pictures up and brought in familiar things for him. Our daughter and I quickly became part of the furniture. The nurses and other professionals were absolutely lovely to us all and I would spend much time chatting with them about Howard and our life. Howard had severe spasticity in both his arms and legs and therefore had many splinting appointments and botox injections. 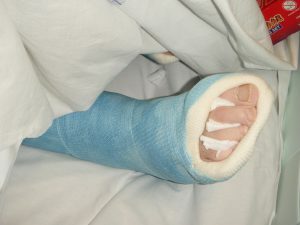 He received SMART assessments (Sensory Mobility Assessment and Rehabilitation Technique).The outcome of a vegetative state was concluded. This was also confirmed by the opportunity we had to go to Addenbrooks Hospital Cambridge where Howard underwent further testing using various stimuli. Despite this I have always taken the view that the more you put into someone the more you will get from them. For Howard it has been very slow but there have been some changes non the less. He started to cry, smile and laugh at Putney and we tried to see whether this was random or as a result of a specific action, it was inconclusive however 3 years on I don’t believe this is the case as Howard definitely only cries when he is distressed and he laughs and smiles at people’s comments. Whether this is to do with the tone of voice I am unsure however it is lovely to see his big smile and it makes me feel that he is happy in his own little world. Whilst at Putney I decided to buy a car that was converted to take a wheelchair and convert our garage into a room so I could bring Howard home for visits. These were such positive steps as it feels we could be a family again. I have also taken Howard to pubs and our daughter’s sports day. In August 2009 Howard moved to a nursing home where we have been welcomed as part of the family. Howard is very settled there and it hasn’t taken our daughter long to get her feet under the table either! I continue to visit him nearly everyday. He has reacted very well to the new sensory room and he is now able to swallow well and enjoy eating a pot of yogurt. Pace of life is much slower here but it is very calming and the staff are very caring. So there you have Howard’s story! It has certainly been a journey but all three of us have been so lucky to have had such great support from friends and family along the way. Meeting Sue, Anne, Lynne and Judy has been such a great help because although our situations are all different we are all caring for a loved one that has a severe brain injury. Of course it isn’t the future we wanted and as time goes on so do the lives of others but this is our life now and I will continue to do as much as I can for Howard to make his quality of life as best it can be. I have seen small but positive changes in him which spurs me on but I’m realistic about the catastrophic damage his brain has received but I will never give up on him because I love him. I made the decision very early on that I didn’t feel that I would be able to have Howard at home. I felt that he would require such a high level of care it would not be fair on either him or myself and our young daughter. In a bizarre way having gotten my head around this at a very early stage it made the inevitable process seem much easier. So, eventually having spent nearly a year and a half at The Royal Hospital Putney, our Primary Care Team were making noises for Howard to move to the next stage. There wasn’t any pressure, I was just advised to start looking at Nursing Homes and I was given a list of a few homes around my area. Me, being me, I wasn’t just going to settle for this list but went about looking on the internet for all the Homes around us. So, what was my criteria? Location was a huge issue. I wanted Howard to be close enough so that I could continue to visit him on a regular basis. I didn’t want a Home that was predominantly old people (I am not being ageist but had to think of how Howard would feel around all the oldies and, of course, the environment our daughter would be being brought up in. I needed a Home that would be able to cater for Howard’s needs. He suffers from extreme spasticity so it was very important that there was access to physiotherapists to assess his ongoing physical needs, splinting, botox etc. I wanted somewhere that was lively and had lovely grounds where I could take Howard somewhere that had lots of things going on, even if Howard couldn’t participate in them, he could be part of them. Staff turnover – I wanted a place that employed their staff and didn’t rely on agency staff. I felt that there would be much more continuity this way and Howard would feel in many ways more secure in his surroundings. So, once this criterion was set in my mind, what did I do next? Firstly, I visited the Homes on the list that I was given by the PCT. To be honest, it was the first time I had been to a Nursing Home and first impressions seemed so important. Secondly, I trawled through the internet and made a short list of Homes to initially call and then visit if appropriate. I did find that may of the Homes in the area did not cater for a man in his early 40’s! So my list was quite limited. Finally, I settled on a Home and went about getting the assessment. My only main concern with this Home was that they didn’t have shower trolley facilities but I was assured that this wouldn’t be a problem. Having been told that they would accept Howard weeks and weeks went past without hearing from them despite my many calls. Eventually, I spoke to them and they told me they didn’t feel they could now cater for Howard’s needs. It was a bomb shell and I was very upset. It felt like Howard’s life could be just dropped and it didn’t matter and he was just a number – I told the Manager as well!! I went for another visit and again started the assessment process. I had learnt a lot from my previous experiences and wasn’t going to make the same mistakes. Seeing the Home for a second time made me see it in a different light. So one bit of advice from me would be to visit several times and have a check list of what you are looking for. This Home ticked all the boxes. Howard finally moved in August 2009 and yet again the change was huge, life was slower but that doesn’t mean you don’t ask for what you want. We have been lucky as Howard’s Nursing Home has their own physiotherapy department and resident OT. The Activities Organiser is passionate about her job so there are always things happening and Howard is involved in many of these. They also have their own sensory room and lovely well maintained grounds. I actively involve myself with the Home, after all, although it’s not our home it’s the place Howard now lives. I am so glad things turned out how they did and I think Howard would be proud. I am always visiting Howard and therefore always up to date with his therapies, medication and general well being which I feel so important. Howard remained at this home for four years and received great care and my daughter and I became part of the life there. Sadly, November 2013 Howard was admitted to Kingston Hospital after aspiration issues and after a short fight he passed away on 26th November 2013.